The most convenient way to travel the city, enjoy Barcelona with the special hop-on hop-off bus tickets on the official double-decker sightseeing bus. Enjoy the major landmarks and places with special discounts which allow you to save up to 200€ on tickets. Explore Barcelona using your Hop-on Hop-off bus tickets allowing you unlimited access across multiple routes with the same ticket. Onboard Barcelona Turisme officers offering insights about the venues and stops. Special discount voucher-booklet for your sightseeing purposes. Onboard wifi and smartphone app with information about the service and city. Want to see all of Barcelona? This is the way to go! 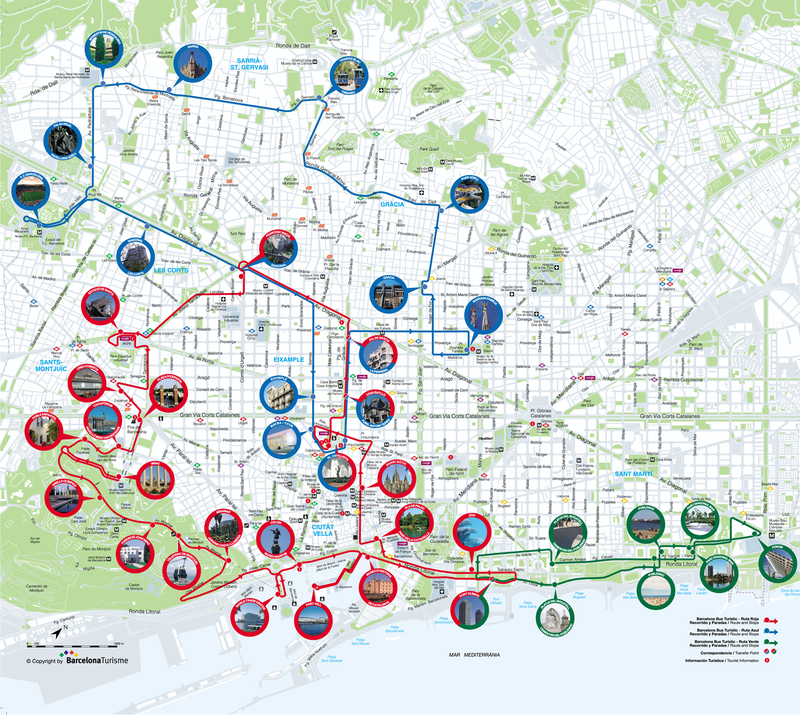 Discover the attractions and sights of Barcelona at your own pace with this unlimited access hop-on hop off bus ticket. The tickets allow you access to three routes in the city and you can jump across all routes with this ticket. Here’s a map showing where the bus route/tour takes you to. The double-decker bus provides scenic views of the surroundings and comes with onboard wi-fi and professional guides to help you out with any query you might have. Take in the grandiose architecture that’s peppered through the streets and see the artistic charm this city is renowned for. Your tickets also come with audio guide in 16 languages that tell you everything you need to know about the city to enjoy your visit. Be sure to check out the special discount voucher booklet that allows you to save on attractions, museums, leisure activities and monuments. You can show your mobile voucher directly onboard the Barcelona Bus Turistic when you get on. The blue and red routes depart from Pl. Catalunya and the green route departs from the Olympic Marina. Tickets are valid for the day of the booking only. Children under 4 years ride for free. Your voucher will be emailed to you instantly. You can redeem your mobile voucher for physical tickets directly after you onboard the Barcelona Bus Turistic. The tour is accessible for individuals in wheelchairs and those with hearing impairments.